How Does A Heated Floor Work? We all know the feeling of stretching a tentative foot out of the warmth of the bed covers only to encounter the shock of a cold floor. The first step is startling, and the second step is usually toward an area rug or the nearest bathroom bath mat. But new technology may make that sensation a thing of the past as more and more homeowners opt for radiant floor heating. But how does a heated floor work? Radiant floor heating isn’t something new, nor is it solely used to take the chill out of ceramic tile floors. The radiant heat method dates back to at least the Roman era, when wealthy homeowners arranged for hot water pipes set under the floors to warm their bare feet as well as the rooms in their houses. In fact, the rising hot air from these heated floor systems maintains a more constant temperature than our more contemporary forced hot air systems. In Europe, radiant heating has been the preferred whole-home heating method for over fifty years. 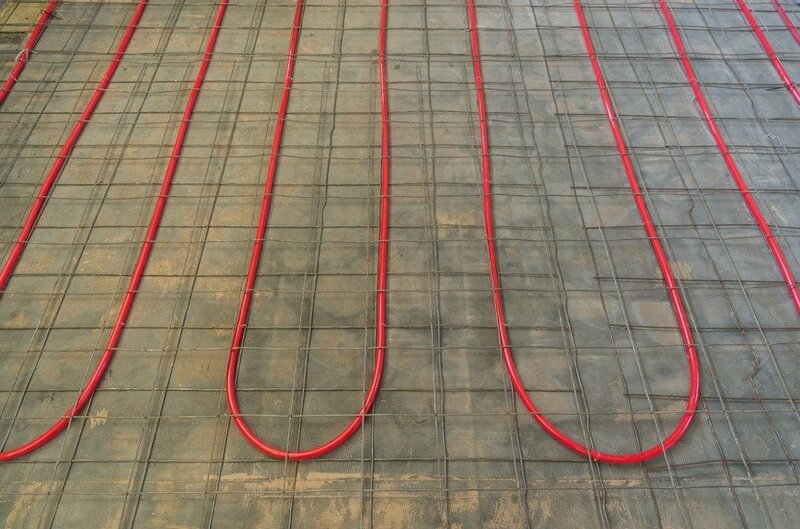 Whether you want to warm your whole house or just warm the bathroom floor, beneath-the-floor radiant heating can be powered in two ways: With warm water tubing or electric coils. The water or “hydronic” method involves installing tubing on a concrete slab beneath the flooring materials. The water is heated by an oil- or gas-fired boiler, or even a kerosene, gas, or solar water heater, and piped through the tubing. This method is favored when the homeowner wants the whole house to be installed with radiant heat, usually in new construction or in older homes set for gut-renovation. In these situations, the hydronic method is much more cost-efficient than electric coils. And although initial installation costs are higher, the hydronic system lasts twice as long as standard furnaces. The electric method involves easier and cheaper installation, which is why it is more commonly used to make smaller areas, such as kitchens and bathrooms, as toasty as can be. Although, like the hydronic method, you have to tear up and replace your flooring material, further installation involves nothing more complicated than an electric hook-up. In sum, plastic mats with embedded coils are unfurled under the flooring material and then wired up for use.